Available from KRSS a used fully refurbished and service Waters Synapt G2 System with Control PC and optional NanoACQUITY. The Waters Synapt G2 is ideal for qualitative and more recently combined qualitative and quantitative workflows. The second generation SYNAPTwaters-synapt-g2 G2 platform from Waters provides a new dimension of performance to drive scientific discovery like never before. 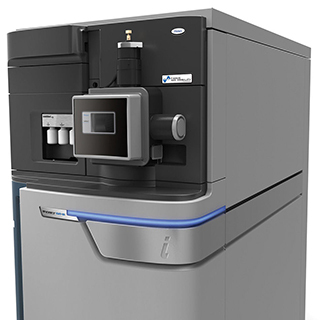 We’ve combined QuanTofwaters-synapt-g2 - breakthrough quantitative Tof technology - and enhanced High Definition MS™ technologies to provide you with intuitive operation, application flexibility and a totally new level of performance for all your applications. SYNAPT G2 HDMS is a high resolution exact mass MS/MS platform designed to get you to the right result, faster - no matter how challenging your application is. When you want to reach beyond the boundaries of conventional mass spectrometry, SYNAPT™ G2 High Definition Mass Spectrometry™ (HDMS™) provides a new dimension to your discovery capability. By enabling you to differentiate samples by size, shape, and charge - as well as mass - this unique capability allows you to make discoveries that simply aren’t possible any other way. QuanTof™ capability: for the next level in qualitative AND quantitative MS and MS/MS performance that is fully compatible with UPLC®. Enhanced High Definition MS™ (HDMS™) performance: enabes a new dimension of discovery, powered by high-efficiency ion mobility separations (IMS) with second generation Triwave™ Technology and DriftScope™ Mobility Environment Informatics. Unrivaled productivity and flexibility: allows you to customize the world’s most powerful MS system to your needs: with multiple ionization options; unique system solution productivity; and future upgrade pathways. Decisions made easy: thanks to Engineered Simplicity™, which delivers the very highest performance and simplicity throughout your entire workflow. So experienced and novice users alike can generate high quality results. Consistently. DriftScope™ Mobility Environment Software (v. 2.1) incorporates new technologies to enable comprehensive retrieval of information contained within HDMS™ (ion mobility) datasets while enabling easier data interpretation (for users of all experience levels) through a series of data visualization and data export enhancements. Enables comparison of measured and theoretical collision cross-sections (shape). Confident detection of partially (IM) separated compounds (e.g. isomers or conformers). Visualize new molecular trends in complex mixtures (e.g. crude oil, PEG, MALDI imaging). More efficient characterization of compounds with novel IMS-based fragmentation studies. Powerful and automated peak detection (novel APEX 3D and 4D technology) comprehensively reveals all components within any HDMS data (e.g. IMS/MS, LC/IMS/MS), increases apparent specificity of each analysis, eliminates subjectivity in data interpretation, and provides highly reproducible results across analyses/users. IMS calibration and CCS determination tools provides facile determination of collision cross-sections from experimental data and known 3D structures. Intuitive visualization tools enable easier and more intuitive data interpretation and provides convenient comparison of peaks and supporting raw data. Peak export functionality facilitates data transfer to downstream processing routines and streamlines data processing workflows e.g. (export of detected peaks directly to Massfragment Software and Elemental composition calculator). 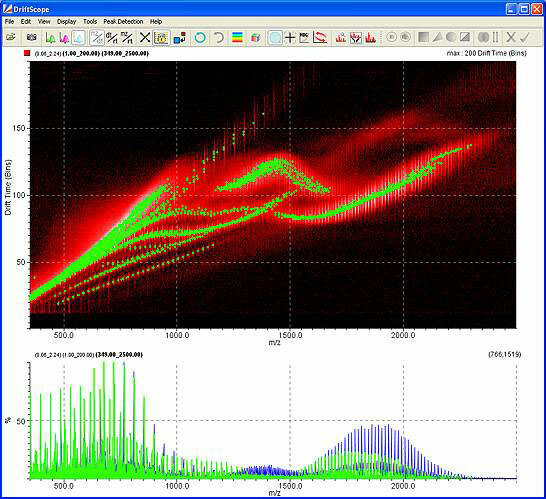 Driftscope Mobility Environment Software (v. 2.1) provides automated peak detection from 2D (chromatograms and mass spectra) or 3D graphical plots. 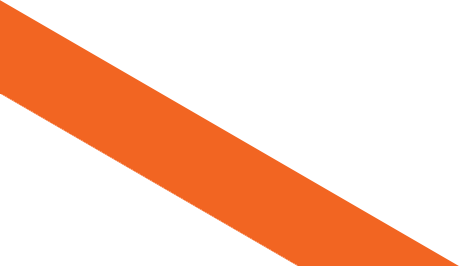 The axes are interchangeable axes; each pixel represents and ion and its color intensity. The peaks are represented as colored (green) dots and sticks. The data shown is from the electrospray (infusion-based) IMS-MS analysis of a Polyethylene Glycol (PEG) sample. When you need to extract the maximum amount of information from a diverse range of compounds, you require the ultimate in ionization flexibility and performance. Waters source technology for second-generation SYNAPT G2 platform enables the widest range of ionization techniques to be utilized universally across a single analytical platform. Providing the highest performance, without compromise, the ionization source options are quick and easy to interchange. ESI/APCI/ESCi®: For the analysis of polar and semi-polar analytes, when coupled with the ACQUITY UPLC® System. Atmospheric Solids Analysis Probe (ASAP): For the rapid analysis of volatile and semi-volatile solid and liquid samples using atmospheric pressure ionization. Nano-flow ESI: For the analysis of minute sample amounts when coupled with the nanoACQUITY UPLC® System. TRIZAIC™ nanoTile™ Technology: Using micro-fabricated nanofluidic UPLC® separations, it utilizes sub-2 µm particle chemistries to provide the very best chromatographic performance simply and without compromise. Atmospheric Pressure GC: Enables rapid switching from LC/MS/MS to GC/MS/MS applications on a single instrument platform. For the analysis of volatile and semi-volatile compounds of low and intermediate polarity. MALDI: Ability to upgrade your system with a high performance Matrix Assisted Laser Desorption Ionization source for exact mass MALDI/MS/MS analyses. Provides easy, rapid switch to API on the same platform. Triwave™ Technology is the enabling technology behind the SYNAPT™ G2 HDMS™ System. It uses three T-Wave™* ion guides that trap ions, separate them by their ion mobility, and transfer them to the orthogonal acceleration time-of-flight analyzer for high-resolution mass analysis. The trap and transfer regions can also be used for fragmentation analyses. The Triwave Technology’s innovative configuration overcomes the major performance drawbacks of conventional ion mobility spectrometry (IMS) by ensuring that IMS does not compromise sensitivity. The second-generation Triwave technology of SYNAPT G2 provides higher IM resolution through the increased operating pressure and length of the IMS T-Wave , while maintaining high transmission efficiency (with the use of Helium-filled entry cell). *The travelling wave device described here is similar to that described by Kirchner in US Patent 5,206,506 (1993). The Atmospheric Solids Analysis Probe (ASAP) is a powerful tool for the rapid direct analysis of volatile and semi-volatile, solid and liquid samples using atmospheric pressure ionization. The ASAP technique utilizes the heated nitrogen desolvation gas to vaporize the sample and a corona discharge for sample ionization. This allows low polarity compounds not amenable to ESI, APcI, and APPI to be ionized with a high degree of sensitivity. Furthermore complex mixtures can be analyzed without the need for any sample preparation. The Atmospheric Solids Analysis Probe is readily fitted to a standard API source by replacing either the ESI or APcI probe assembly. A corona discharge pin also requires fitting. The close proximity of the sample, when loaded onto a glass capillary tube, to the point of ionization and the MS inlet, improves sensitivity whilst also ensuring safety due to the enclosed source housing. Instruments are operated in combined Electrospray/APcI mode (ESCi®). This provides for the acquisition of both analyte data in APcI mode and reference data in electrospray mode, enabling exact mass measurements to be produced. The probe is designed to have both fixed and removable sections to allow rapid sample introduction without removal of the complete assembly ensuring stable source conditions.